They are made w/ Premium Quality Materials. Breathable canvas upper, and a rubber sole to keep active kids stay up on their little feet. Kid’s shoes that are as easy to wear as they are to get on your feet. Classic & fashionable, they keep looking better every time you wear them. Our shoes are durable, breathable supportive and affordable footwear; ensuring to last them a long time. Saving you money in the long run! It’s Classic look gives it the versatility to match any style you want for your little girl/boy and toddlers. Available in simple colors yet eye catching. Your little kiddos feet will stay protected, comfortable & stylish. So adorable & would be a great purchase you won’t regret. They are stylish and trendy and do not obstruct any style you want for your toddler. Pure White - A simple & classic color design, giving the little ones a sharp and clean look. Pure Black - When combined w/ other colors it can have a very strong on-point look. Black /White - It gives a classic elegant look making him/her always on trend & kept in style. Well Made, Durable & Safe To Wear! 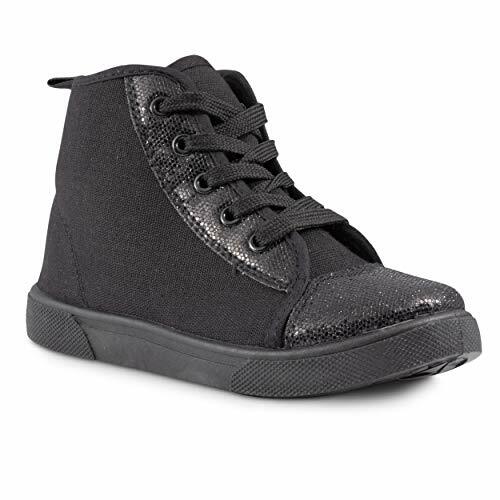 Fashion Sneakers for Kids for those who require every day fashion and style in a truly practical and functional shoe, it not only enhances the appearance of their outfit, but make you want to cuddle them for looking so adorably stylish! ESPECIALLY MADE WELL FOR THEM: It's around this age that toddlers/little kids love to learn and explore. Our kid's shoes not only boosts the style of their outfit, but they also give the needed comfort, moving with more enjoyment. Less complaining and more enjoyment! Plus, giving their little feet a kick of style as a bonus w/ Chillipop Lace Up Shoes for Kids. This high top sneakers was designed to endure your little ones' hyperactivity, ensuring to last them long!